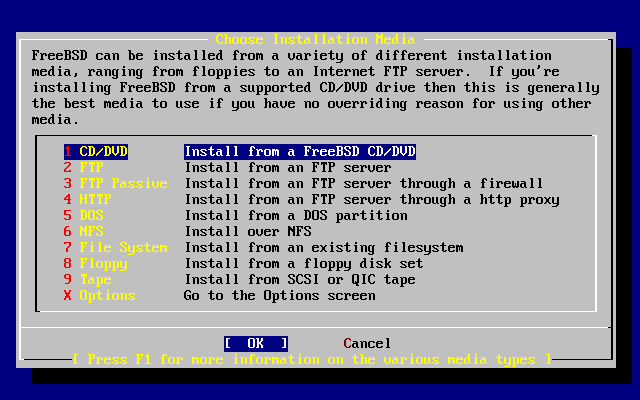 If Installing from a CDROM or DVD, use the arrow keys to highlight Install from a FreeBSD CD/DVD. Ensure that [ OK ] is highlighted, then press Enter to proceed with the installation. For other methods of installation, select the appropriate option and follow the instructions. Press F1 to display the Online Help for installation media. Press Enter to return to the media selection menu. FTP Installation Modes: There are three FTP installation modes you can choose from: active FTP, passive FTP, or via a HTTP proxy. This option will make all FTP transfers use “Active” mode. This will not work through firewalls, but will often work with older FTP servers that do not support passive mode. If your connection hangs with passive mode (the default), try active! This option instructs sysinstall to use “Passive” mode for all FTP operations. This allows the user to pass through firewalls that do not allow incoming connections on random TCP ports. This option instructs sysinstall to use the HTTP protocol (like a web browser) to connect to a proxy for all FTP operations. The proxy will translate the requests and send them to the FTP server. This allows the user to pass through firewalls that do not allow FTP at all, but offer a HTTP proxy. In this case, you have to specify the proxy in addition to the FTP server. For a proxy FTP server, you should usually give the name of the server you really want as a part of the username, after an “@” sign. The proxy server then “fakes” the real server. For example, assuming you want to install from ftp.FreeBSD.org, using the proxy FTP server foo.example.com, listening on port 1234. In this case, you go to the options menu, set the FTP username to ftp@ftp.FreeBSD.org, and the password to your email address. As your installation media, you specify FTP (or passive FTP, if the proxy supports it), and the URL ftp://foo.example.com:1234/pub/FreeBSD. Since /pub/FreeBSD from ftp.FreeBSD.org is proxied under foo.example.com, you are able to install from that machine (which will fetch the files from ftp.FreeBSD.org as your installation requests them).